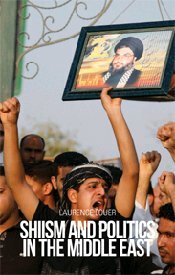 From Columbia University Press, a new book by Laurence Louër (research fellow at CERI/ SciencesPo in Paris), Shi’ism and Politics in the Middle East (forthcoming May 2012). The publisher’s description follows. Laurence Louër’s timely study immediately precedes the recent outbreak of unrest in Bahrain, triggering the escalation of the so-called Arab Spring of 2011. In addition to issues relating to the role of Shiite Islamist movements in regional politics, Louër provides background for the Bahraini conflict and Shiism’s wider implications as a political force in the Arab Middle East. Louër’s study depicts Bahrain’s troubles as a phenomenon rooted in local perceptions of injustice rather than in the fallout from Shiite Iran’s foreign policies. More generally, her work argues that although Iran’s Islamic Revolution had an electrifying effect on Shiite movements in Lebanon, Iraq, Saudi Arabia, and the Gulf, in the end local political imperatives are the crucial driver of developments within Shiite movements—though Lebanon’s Hezbollah remains an exception. In addition, the rise of lay activists within Shiite movements across the Middle East and the emergence of Shiite anticlericalism has diminished the overwhelming influence of the Shiite clerical institution. Ultimately, Louër dispells the myth that Iran determines the politics of Iraq, Bahrain, and other Arab states with significant Shiite populations. Her book couldn’t be more necessary as revolution continues to spread across the Middle East.